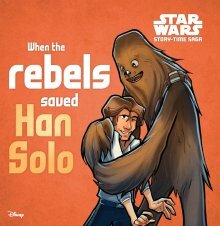 In When the Rebels Saved Han Solo and When Princess Leia Met the Ewoks you’ll find two stories that capture some of the central plot lines of the original Star Wars movie trilogy. The first is from The Empire Strikes Back and the second from Return of the Jedi. 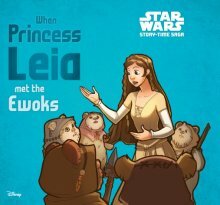 There’s also a third book in the Star Wars Story-Time Saga series, When Luke Skywalker Met Yoda. All a part of the stories are booby traps, hungry monsters, a metal planet called the Death Star, the “bad gangster slug” Jabba the Hutt, droids, little furry creatures (otherwise known as Ewoks), the “kind and good” rebels, and the “cruel and bad” Darth Vader. While the illustrations should appeal to young readers, the text is unfortunately rather clunky, perhaps due to the efforts at distilling movies of greater length and depth into simple text in just 32 illustrated pages. Regardless, young Star Wars fans, Jedis and others will probably enjoy seeing their favourite characters depicted on the page.